There’s pleasantly exhausted, and then there’s on-the-brink exhausted. Two nights ago, I was the latter. As Smoke prepared for bedtime, I walked through our house and tried not to look too hard. Everywhere, there was a sight that raised my blood pressure. There’s a pile of laundry in the armchair that hasn’t disappeared for weeks. There are the shelves full of expired medications and near-empty bottles of supplements. There are about a dozen piles scattered throughout the house of paperwork that has no home. Some days it feels like I can’t reach for something I need without eight things I don’t need falling to the floor. This is a problem, yes, but it’s not a new problem. It’s a problem I live with until I get so tired that I don’t think that I can live with it anymore. If I came to this point at 9 am on a Saturday morning, then perhaps I could put the feeling to use. But at 9 pm on a weeknight, it translates to nothing but desperation, and even though I feel far more cranky than sleepy, I try to tell myself, over and over, “Go to sleep as soon as you can.” I was afraid that if I didn’t I might fall apart–on myself or on someone else. But it was my night to put Smoke to bed, and he never wants me to go to sleep as fast as I can. He wants books followed by meandering conversations, and he’s never sufficiently impressed when I report to him how late it is. Every week Smoke comes home from kindergarten with some small book he’s made and memorized, and so I often have him read to me at bedtime as a warm-up. 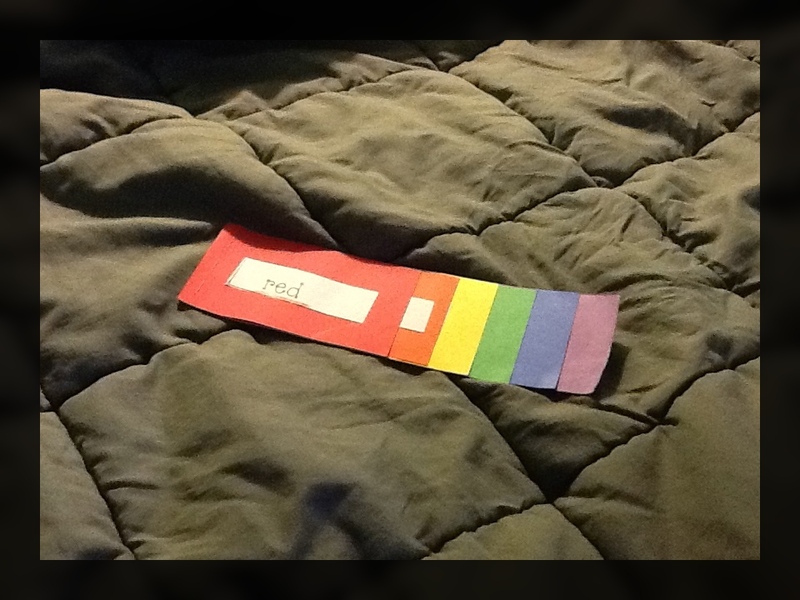 Smoke had come home with this rainbow book, and I had placed in on his bed earlier in the evening so that we would remember to read it. But when we got to bed, Smoke wanted to skip it. He only wanted to read about ninjas. In spite of my mantra (Go to sleep as fast as you can!) I fought him. “Why won’t you read to me?” I asked while at the same time I wondered: why was I picking a fight? Of course Smoke started singing: Red-orange-yellow, green-blue-purple, red-orange-yellow, green-blue-purple—clap!—make a rainbow bright. It was the clap that did me in. I was totally unprepared for the earnestness of that clap. I’m quite certain that the earnestness of that song, its unapologetic sweetness, is exactly why Smoke had wanted to forgo it in favor of his ninja book. At six, he’s just aware enough to recognize innocence and be suspicious of it. But, when pressed, he reluctantly administered the medicine I needed. That was kind of him. “Do you think I cried?” I asked. Smoke wasn’t sure, and so I pointed to the corner of my eye. We laughed at my one little tear, and then read about ninjas for much longer than I wanted to. And then we went to sleep. Thanks–I’m always worried I’ve described the same scattered scene about a thousand times here. Some things never change, like the endless pile of laundry.